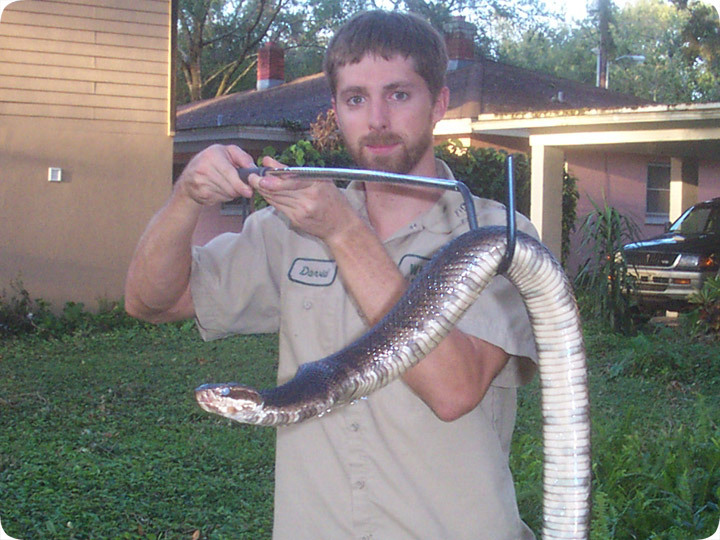 09.22.2004 - Here's a Cottonmouth Snake (Agkistrodon piscivorus) that I caught in Orlando Florida. The Cottonmouth gets its name from the color of the inside of its mouth, which is white, and which the snake often displays, with a wide open gaping, if threatened. It does not have rattles to warn of its venomous bite. It is a member of the pit-viper family, which mostly consists of rattlesnakes. The Cottonmouth is a rare exception, and it's also unique because it is an aquatic snake. It seems to prefer swampy areas the most, but also lives in and around most bodies of water. This snake is not terribly common in the Orlando area, but it's also not terribly rare either, and people walking the water's edge or near swamps should be wary of them, as they tend to coil up and bask lazily. I almost stepped on one once. It's a very fat snake, and very buoyant in the water, where it swims with most of the body protruding above the surface and its head held at a 45 degree angle. It eats mostly fish and frogs, gives birth to live young, and grows to a maximum of six feet, though it's rare to find one above five feet. This snake has a very serious bite. It's one of the few snakes that can actually deliver a fatal dose of venom to an adult person. It's far more serious than the Copperhead, which is a northern aquatic viper. The larger the snake, the greater the quantity of venom, and a large adult can administer up to 4 ml. As with all pit vipers, it injects a cytotoxic (tissue dissolving) venom. I used to think that these snakes delivered hemotoxic (blood cell dissolving) venom, but I read that it's cytotoxic. The Cottonmouth in the above photo is about to shed, which is why the skin is somewhat cloudy and the eye looks blue. The skin over the eye is cloudy as well. But that doesn't mean that this snake can't find and strike me or any other warm-blooded animal - the pits near the nostrils allow this snake to detect heat, and strike at that.